This is especially impressive considering Adam Eaton, Trea Turner, and Bryce Harper played in 23, 98, and 111 games, respectively. Eaton’s replacement in center, Michael Taylor, missed a month. Daniel Murphy and Jayson Werth also spent some time on the DL. The outfield will be one of the best overall in the game. Harper will be Harper. A healthy Adam Eaton is a significant upgrade over Jayson Werth — offensively, defensively, and on the bases. Andrew Stevenson, Ryan Raburn, Alejandro de Aza, and Chris Heisey played in more games than the Mighty Mouse. In 2016, when he was predominantly a right fielder, Eaton posted a 6.2 fWAR season. Playing left field, a 4-5 win season out of Eaton is a reasonable expectation. Taylor showed a flair for the dramatic in the playoffs, and had an excellent season last year. If he can post a .250/.300/.450 slash line—with his defense and speed, he will far surpass FanGraphs’ paltry 1.2 WAR prediction. However, if he continues to strike out 30% of the time and hover around the Mendoza line, like he has every year before 2017, his replacement is ready and waiting in wunderkind Victor Robles. The left side of the infield will be fantastic again — a healthy Turner and Anthony Rendon are terrific offensively and defensively. Rendon will give another .300/.400/.500 type season (and get snubbed from the All Star Game again, in his home park). A healthy Turner, in between Eaton and Harper, will give opposing pitchers fits. One hundred stolen bases from Spanky and the Roadrunner might be a reality. The right side of the infield presents some questions. Daniel Murphy is recovering from micro-fracture surgery. Howie Kendrick and super-utility man, Wilmer Difo, will fill in. Kendrick is a fantastic hitter, but not as good as Murphy. Difo is much better defensively, but obviously not the hitter either Murphy or Kendrick are. In 2016, Justin Turner had the same surgery, he played in 151 games, posting a .832 OPS (his previous years: .897 and .861). 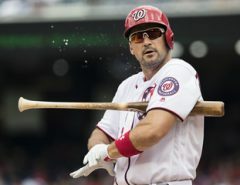 Turner’s drop off was not all that significant, how much will the injury affect “Hits?” Ryan Zimmerman‘s Ryan-ssaince was a joy to watch last year—given how The Face has struggled with injuries and performance the last few years. Will his rebirth continue? Even fully healthy, a 36-homer season might be unrealistic. The Nationals’ weakest area is the black hole behind the plate. The Nationals have one of the worst catching situations in the majors. Matt Wieters was terrible last year. After a torrid April, Wieters slashed .209/.263/.304. Then there is his performance in Game 5… His backup is Miguel Montero, who threw Jake Arrieta under the bus when Turner, Taylor, and the rest of the Nationals ran all over the Cubs. He was subsequently released. The biggest addition to the offense might just be new hitting coach Kevin Long. He has starting working with Wieters and prospect Andrew Stevenson (while vowing to leave hitters like Rendon alone). If Spring Training is any evidence, Stevenson hit the ball well—posting a .458 SLG in 48 spring PAs (he had a .448 OPS in 2017). Long is considered one of the best hitting coaches in the game and should be an invaluable asset. The Nationals have one of the best rotations in baseball—no one (despite what Fangraphs and MLB.com think) can boast a 1-2 punch like three-time Cy Young winner, Max Scherzer, and top-3 Cy Young finalist Stephen Strasburg: Not the Dodgers, not the Cubs, not the Astros, not the Yankees, not the Mets, no one. Max Scherzer is arguably the top pitcher in the game (with Kershaw, Kluber, and Sale in the discussion.) Stephen Strasburg came off his yearly DL stint to post an other-worldly performance: 0.84 ERA, 10.6 K/9, .440 OPS against, and a 34-inning scoreless streak. Stras has a 0.47 ERA in the postseason and was utterly dominant in Game 4, when the game time temperature was 59 degrees, with wind, rain, and being sick. For all the criticisms Strasburg receives for being an “orchid,” he’s pitched one fewer inning than Clayton Kershaw the last two years. Gio Gonzalez is one of the most underrated pitchers in baseball, and is surprisingly consistent (from year to year, not game to game). Since 2010, he has between 2.9 and 3.1 WAR, posting highs of 3.7 (2015), and 5 (2012). While he might be the most frustrating pitcher from AB to AB, he is going to give the Nats approximately 180 IP, 8.5 K/9, 3.5 BB/9, which is right in line with most other team’s third starter. Though, he should never pitch another Game 5, ever again. He’s pitched in two, and didn’t make it out of the fifth in either—both terrible, gut-wrenching, soul-crushing, heart-breaking, TV-smashing losses. The Nats fourth starter, Tanner Roark, suffered his worst year, as a full-time starter (discounting his horribly mismanaged 2015). After pitching in the WBC, he struggled with consistency. He surrendered a career high BABIP (.300) and a career worst soft contact percentage (16.7%). Roark lives and dies by ground balls and soft contact—however no other peripherals changed by any significance. Many of the pitchers who pitched in the WBC last year struggled with injuries and performance—expect a return to his career norms this year. The fifth spot in the Nats rotation will keep fans up at night—Cole will begin the year, but most likely won’t end the year there. We will see some of Erick Fedde, Jeremy Hellickson, maybe an E-Jax appearance or three. There is a reason the Nationals spent 21 of 40 picks, including 9 of their top 10, in this past draft on pitching. Wil Crowe (2nd round pick) might be a fast-to-the-majors type and make an appearance in the second half — or Joe Ross could return from Tommy John to give the back-end of the rotation a boost. Most likely, the fifth starter who will finish the season is not currently on the roster. Despite this, the Nationals won 97 games last year with Ross, Jackson, and Cole making combined 34 starts—none of whom had a FIP under 4.99 (Ross). What a world of difference a year makes for the bullpen! At this time last year, the Nationals were relying on Sammy Solis, Shawn Kelley, and Blake Treinen to close out games. It was the worst bullpen in the major leagues for the first half of the season. Mike Rizzo changed that in two weeks in July, trading for Sean Doolittle and Ryan Madson in mid-July, and then Brandon Kintzler minutes before the deadline. The Law Firm was formed. Kintzler re-signed here, and the Nationals have a strong, very reliable back-end of the bullpen. They will still rely on Solis, Kelley, Trevor Gott, Matt Grace, and Enny Romero—one of those will return to the minors when Murphy is healthy. Kelley has continued his habit of giving up home runs into Spring Training—he gave up 4.15 HR/9 last year, the highest rate in the majors. He was worse than Francisco Rodriguez, who was cut by two teams—the Tigers and Nationals. He should be on a very short leash. Romero has break-out potential after posting career high 10.5 K/9, and career low 3.7 BB/9. He has upper-90’s heat (98 average velocity); if he can throw a slider or his cutter for strikes, he will be a dangerous weapon. Matt Grace was very effective against LHB last year—holding them to a .550 OPS against (.813 OPS against vs RHB). He will essentially replace Oliver Perez. Solis said recently that he lost feeling in his fingers at times last year, and he is fully healthy now. If so, and he can return to the 2016—in which he as effective against both righties and lefties, this will be a deep bullpen. One name to keep an eye on in AAA is Wander Suero. He impressed during the spring, and has posted some impressive numbers in the minors. And, we all wait for the day when “Killer” Koda Glover is healthy. If, and this is a big if, Glover can live up to his potential—the Nationals will play a lot of “6 inning” games this year. Very little has changed from the 2017 Nationals—23 of the 25 man roster played for the Nationals last year. The only additions are Miguel Montero and Matt Adams, replacing Jose Lobaton and Adam Lind respectively. The biggest change is behind the bench, where Davey Martinez replaces Dusty Baker. Martinez, a disciple of Joe Maddon, has already brought his unique brand of fun: including a golf contest, bag-pipers, and camels. If it works, he’s a genius, if not he’s a weird goof. Replacing Mike Maddux is former Cardinals pitching coach Derek Lilliquest. He took over late in the Cardinals 2011, when Dave Duncan abruptly stepped down. The Cardinals later won the World Series. Lillequest served as the pitching coach until this last year. Under his tutelage, the Cardinals were fifth in total pitching WAR, behind the Dodgers, Indians, Nationals, and Yankees. While Maddux is revered, Lilliequest is no slouch. Tim Bogar replaces Davey Lopes, who retired. Chip Hale replaces Chris Speier. Hale is interesting because he brings valuable managerial experience to the first time manager, Martinez. Overall, this is a deep, talented team. While the NL East is improving, it isn’t there yet. 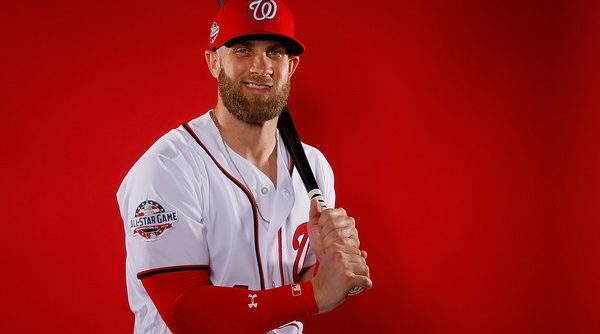 The Nationals should win the division again…what happens after that is anyone’s guess!